One of our holiday apartments on Santa Maria in the San Eugenio area of Tenerife. The apartment is on the 4th floor and enjoys a pool and sea view. 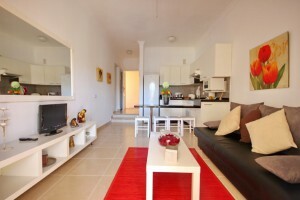 One of our holiday apartments on Santa Maria with two double bedrooms. It is in a great location on the complex being on the 4th floor with sea and pool views. The balcony has both sun loungers and a table and chairs for alfresco dining. There is also a sun awning. The lounge has an L-shaped sofa and there is also a flatscreen TV with satellite channels and wifi internet access. There is also a dining table and chairs. The kitchen is well equipped including an oven, ceramic hob, tall fridge/freezer, as well as a washing machine and tumble dryer. There are two bedrooms both with double beds and the bathroom as a bath with shower overhead. 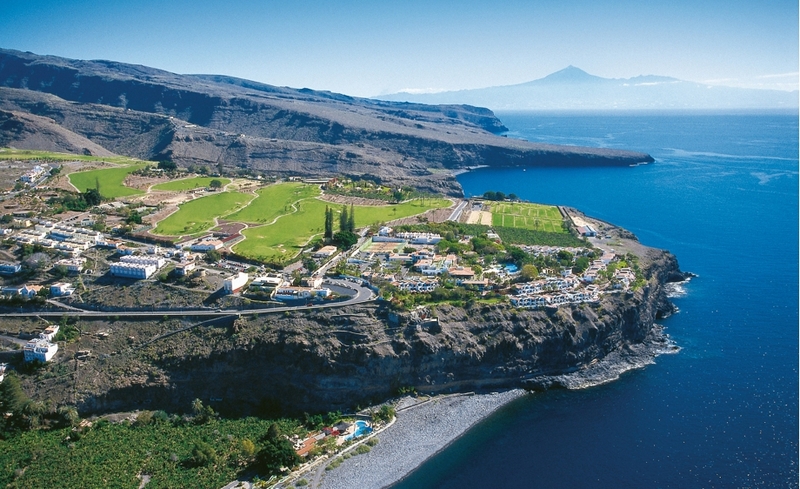 Why not take a day trip to the neighbouring tiny island of La Gomera. It is a tiny island famous for it’s vibrant history and beautiful scenery. There are lush laurel forests, crystal clear waters, palm trees, green mountains and dramatic valleys. You can take a ferry from Las Cristianos port, which leaves between 7am and 8am on Tuesdays, Thursdays and Saturdays. The ferry journey takes 90 minutes and lands at the capital of the island San Sebastian de la Gomera. A coach then takes you on a sight-seeing tour of the island, stopping on the way to sample typical La Gomera cuisine for lunch. One of our Parque Santiago 2 apartments to rent. The apartment has two bedrooms and two bathrooms with air conditioning and a washing machine. 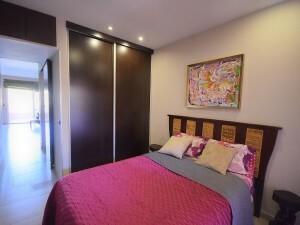 This is one of our Parque Santiago 2 apartments to rent. It is a duplex apartment with air conditioning. The balcony enjoys a good pool view and is equipped with a sun awning, patio table and chairs. The lounge has a sofa bed with a flatscreen TV with satellite channels. The dining area has a white wooden dining table with matching dresser. There is a fully equipped kitchen, which includes a microwave, fridge, ceramic hob and a washing machine. There are two bedrooms, both of which have double beds and two bathrooms with showers. 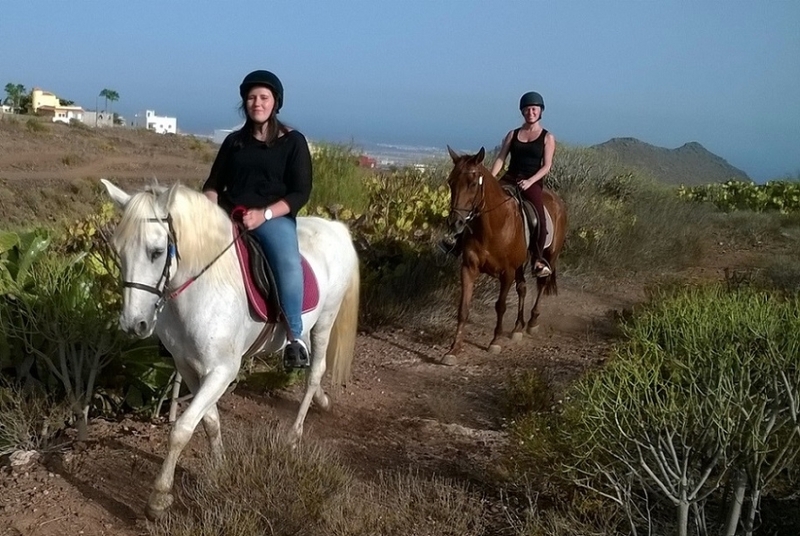 Beautiful scenery on the bridlepaths with views to Mount Teide as well as the islands of La Gomera and Gran Canaria. There are many horse riding schools in Tenerife. One British owned school is Horse Riding Adventures in Tenerife. Anyone can join in from complete beginners to advanced riders or children from the age of 4 years. The company offers a pick up and return service to your accommodation from El Medano to Palm Mar. The scenery is spectacular on the bridle paths. On clear days you can see El Teide as well as the neighbouring islands of La Gomera and Gran Canaria. The company won a Certificate of Excellence on TripAdvisor in 2013 and has an amazing 160 out of 164 reviews which rate it as excellent or very good. The horses are well trained and cared for. They live in large paddocks where they live and play together. One of our Yucca Park apartments to rent in Fanabe, Tenerife. This lovely apartment has been fully refurbished in a modern style with a washing machine. This is one of our Yucca Park apartments to rent, which has been refurbished in a modern style. The complex is situated in the Fanabe area of Costa Adeje in Tenerife. It is only one line back from the sea front, so is very close to Fanabe Playa, a long sandy beach lined with plenty of restaurants and bars and other amenities. The lounge is furnished with a comfortable sofa bed and there is a flatscreen TV with satellite channels, beneath a large mirror. Patio doors lead out to the balcony which enjoys a pool view and has been furnished with a patio table and chairs. The kitchen is modern and well equipped with a full oven, ceramic hob and extractor fan. There is also a breakfast bar and stools as well as a tall fridge/freezer. The bedroom has 2 single beds, fitted wardrobes, and a dressing table with mirror. The bathroom has a shower cubicle with wash hand basin, WC and there is also a washing machine. Toy dog with white, curly, fluffy fur, which is said to have originated in Tenerife. 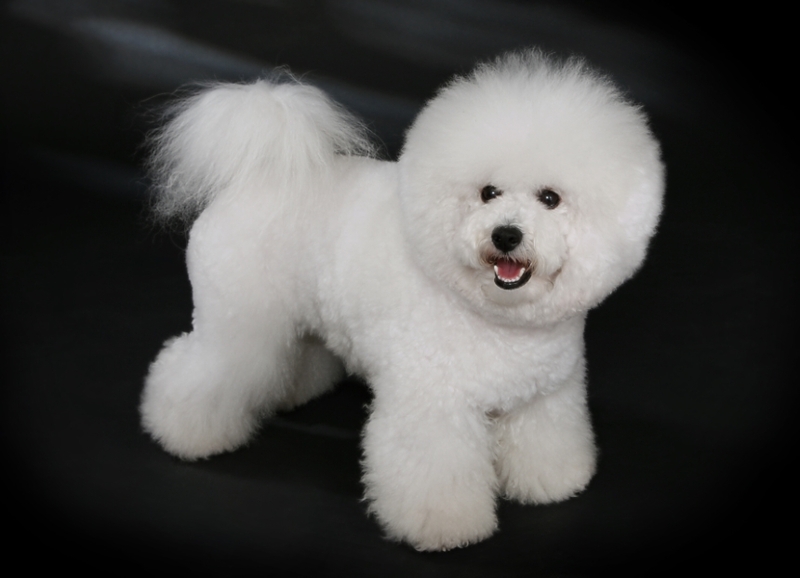 The Bichon Tenerife is one of 4 varieties of Bichon breeds. The other three being Maltese, Havanese and Bolognaise. They originated in the Mediterranean, but there are some rumours indicating that this breed originated in Tenerife. It is said that sailors took hem from Tenerife to Europe in the 14th century. Today they are very common breed on the island. 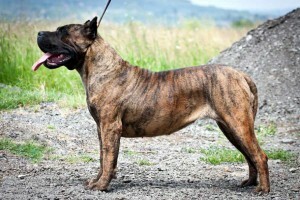 The Dogo Canario is similar to the mastiff and is large thick set shepherd dog. It has a broad, square head and a powerful, muscular shape. The ears are often cropped for safety while working with cattle. It is also known as the Canary Mastiff, and was used as guard dogs by peasants, working in the fields. The breed is said to have been created as a result of the Roman Conquest of Britain from around 43AD. Both the Romans and British had dogs fighting alongside them: the Romans used a breed called Molossus from Greece and the British a broad-mouthed Mastiff. The Romans were so impressed by the latter that they later bred from the 2 breeds and the resultant breed became the Dogo Canario, as the Romans exported the dogs to Spain for guarding, hunting big game and baiting. The breed can be suspicious of strangers, which of course makes them good guard dogs and they can be difficult to train if not tackled early. 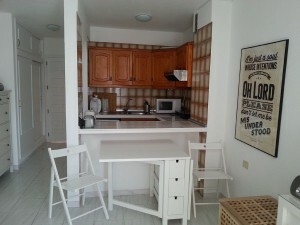 A studio to rent on Santa Maria Tenerife, which has been refurbished to a very high standard. The apartment includes a washing machine. 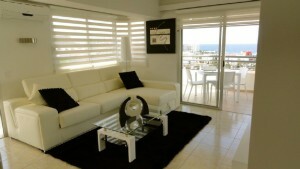 A studio to rent on Santa Maria Tenerife which has been fully refurbished to a very high standard. 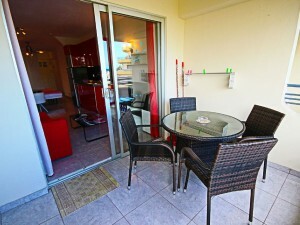 The balcony is furnished with patio table and chairs and enjoys sea and mountain views. Inside as you will see from the photos the owner has furnished the apartment with a red theme. Personally it is my favourite colour. There is a large double sofa bed in the lounge with a flat screen HD TV with satellite channels. There is also a modern dining table and 4 chairs. The kitchen is very modern and stylish with red kitchen units and a stainless steel large fridge/freezer and oven/microwave. There is also a 2-ring ceramic hob and extractor fan as well as the expected items such as kettle, toaster and coffee maker. The bedroom area has two single beds and fitted wardrobes. The bathroom has a bath with shower overhead, wash hand basin, WC and a washing machine. 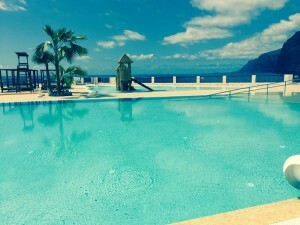 A public pool in Los Gigantes, Tenerife. Oasis is an outdoor public swimming pool, situated below the giant cliffs at Los Gigantes in Tenerife. The salt water pool is heated and enjoys amazing sea views. There are slides and also a childrens’ pool. The pool is surrounded by large gardens with swing chairs, sun loungers and Balinese beds, where you can relax. Oasis is a great place where you can spend the day. It is open daily from 10am to 6pm. An all day adult pass with full facilities only costs 8 euros, or if you want to arrive in the afternoon from 3pm, you only pay 4 euros. There is a bar/cafe/restaurant on site which serves drinks, snacks and full meals. There are even tennis courts, a bowling green and a physiotheraphy service as well. 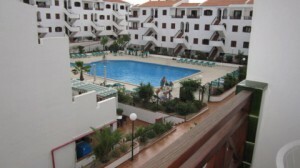 A selection of self catering Santa Maria studios for holiday let Tenerife, which can be booked through holidays4u.org. Santa Maria apartments can be booked through holidays4u.org. There is a selection of studios, one and two bedroom apartments offered on a self catering basis. This is one of our Santa Maria studios for holiday let Tenerife. It is on the ground floor with an elevated balcony to increase the privacy of guests. The studio is well equipped with two single beds in the bedroom area and a sofa bed in the lounge. The apartment is therefore suitable for up to 3 people sharing. There are two ceiling fans and two portable fans. For entertainment there is satellite TV and a DVD player. There is also a selection of books. The kitchen includes a 2-ring hob, microwave and a washing machine. PADI and SSI diving school near Santa Maria in San Eugenio, Tenerife. Blue Bottom Diving is a PADI and SSI diving school for beginners through to advanced divers. 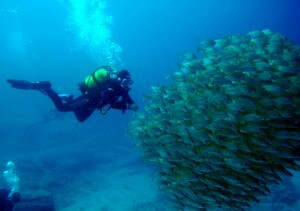 It offers diving courses and guided dives using high tech diving equipment. As the safety of the divers is of paramount importance this equipment is replaced regularly. For example, they have recently replaced their rib with a purpose built aluminium dive boat of the highest quality and fully equipped with all the necessary diving equipment such as GPS, radio, mobile phone, sounder, oxygen, first aid, life jackets, flares and smoke signals. They use a team of instructors from around the world, which therefore means that they can offer courses in multiple languages. On TripAdvisor this diving school has some excellent reviews and was awarded the Certificate of Excellence in 2014. It is also rated no 1 out of 19 water sports providers in Costa Adeje. 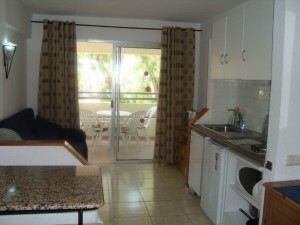 A studio to rent in Los Cristianos Tenerife. It is situated on the 3rd floor on the Summerland complex. The studio is very cosy and romantic. A cosy, romantic studio for 2 people on the Summerland complex in Los Cristianos, which has a heated pool. The studio enjoys small sea views from the balcony. There is an L-shaped sofa bed which faces a flat screen TV (Apple TV). There is also wifi internet access. A small dining table and 2 chairs are also provided. The small kitchen is equipped with the usual appliances such as a fridge, microwave, hob, extractor fan, coffee machine, toaster, kettle etc. There is large chest of drawers for storage. The bathroom consists of a shower enclosure, wash hand basin and WC. There is also a washing machine in the bathroom. 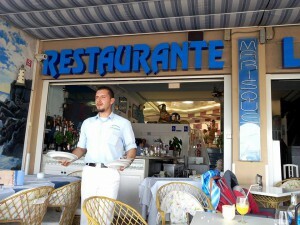 Restaurant serving mainly Spanish cuisine in Los Cristianos. This restaurant is run by an Austrian couple, and which serves mainly Spanish cuisine. The food is freshly cooked and delicious. The courses are nicely paced to allow guests to savour their meals in a perfectly relaxed atmosphere. It is advisable to book in advance however, as it can get very busy. The restaurant has been awarded the Certificate of Excellence on TripAdvisor and has been rated no 4 out of 298 restaurants in Los Cristianos on this review site. Infact 257 reviews out of 269 rate the restaurant as excellent or very good. The restaurant is open Tuesday to Saturday from 6pm to 11pm and from 1pm to 11pm on Sunday (closed on Mondays). Starters on the menu include king prawns and tuna tartar. Main courses include lamb and king prawn risotto. Desserts include white and chocolate mousse. There are daily specials which have included roast goose. One of our apartments to rent on Vera Mar in the Los Cristianos resort in Tenerife. The complex is situated in a great location as it is right on Las Vistas Beach. This two bedroom is one of our apartments to rent on Vera Mar. 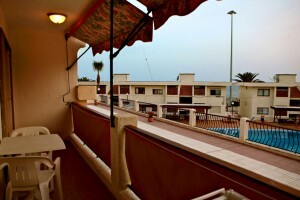 The complex is situated right on the sea front on Las Vistas Beach. It is therefore in a very enviable location. The owner offers a few extra perks. There is wifi internet access available in the apartment for a small weekly charge. The owner also provides towels for the beach as well as the usual towels for the bathroom and linen for the beds. There is also parking on the complex, available free of charge (on request). As can be seen in the photo above the balcony enjoys a pool view. Although a ground floor apartment, the balcony is elevated from the pool area. The lounge is furnished with a sofa and armchair, dining table and chairs as well as a flat screen TV. The kitchen is fully equipped and includes a microwave, hob and fridge etc. There are two bedrooms: one with a double bed and the other with two single beds. Overlooking the Barranco de Inferno at the top of Adeje. Otelo Restaurant is situated at the top of Adeje, overlooking the Barranco de Inferno. The restaurnat is open daily from 11 o’clock in the morning until 11 o’clock in the evening. It is advisable to take a taxi, as the restaurant is up a steep road. But it is well worth it as the food and the views are amazing. What you can expect is cheap, simple, good quality Canarian dishes. The restaurant is also furnished simply with plastic chairs and tables. But the view is stunning. So if you are looking for delicious, straightforward Canarian views with amazing views, this is the restaurant to come to. 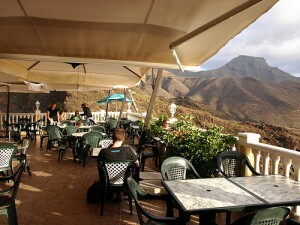 Infact the restaurant specialises in Canarian dishes, such as garlic chicken, which seems to be their signature dish. It is marinated, then roasted and then fried without breadcrumbs. It is therefore crispy but not too greasy. It is usually served with Canarian potatoes and mojo sauce. The rabbit dish is also very good. It is a good sign of a good restaurant that it gets filled very quickly with locals. 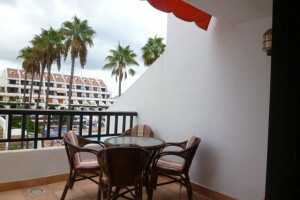 An apartment to rent on Victoria Court II in the Los Cristianos resort in Tenerife. The apartment has a pool view, as well as a washing machine. This apartment to rent on Victoria Court II has a lovely pool view from the balcony. Both Victoria Court I and II are very popular complexes, so it would be advisable to book up well in advance. The apartment is comfortably furnished and can sleep up to 4 people. There are two single beds in the bedroom and a double sofa bed in the lounge. The apartment also has satellite TV. The kitchen is fully equipped including a washing machine, full oven, hob, extractor fan, toaster, fridge etc. The bathroom has a bath with shower overhead, a wash hand basin and WC. A Spanish tapas bar on Las Vistas beach with amazing sea views. El Pincho is a Spanish tapas bar and restaurant on Las Vistas beach. It therefore enjoys amazing sea views. The bar is open for lunch and dinner and serves drinks and food. On TripAdvisor it has been awarded the Certificate of Excellence. It is rated no 13 out of 299 restaurants and has 311 excellent and very good reviews out of 342. The menu includes garlic prawns and tuna salad, chicken and chips, crab salad on bread, seafood paella and ham & cheese omelette. The tapas dishes include pimientos pardons (small green peppers), Spanish tortilla, chicken wings, bruschetta and chicken croquetees. Desserts include fruit cocktail made with fresh fruit. The jug of sangria is also highly recommended. If you just want to have a drink, the staff will offer you complimentary nibbles with your drinks: garlic olives and peanuts. 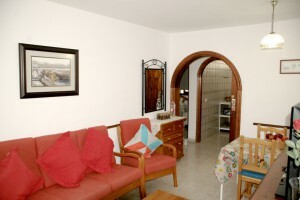 One of our self catering Vera Mar apartments Tenerife with two bedrooms. The complex is in an excellent location as it is right on Las Vistas beach. This is one of our self catering Vera Mar apartments Tenerife. This complex is in a great location on the border of Los Cristianos and Las Americas, as it is right on the sea front at Playa de las Vistas. The apartment comes with a few extra not found in most other apartments. Beach towels are provided as well as linen for the beds and towels for the bathroom. Wifi internet can be provided for a small additional charge. And there is also parking available on the complex, which can be available to guests on request. The lounge has a 3-seater sofa and 2 armchairs, as well as a coffee table and flat screen TV. There is also a dining table and chairs and patio doors lead out to the outside space. A fully equipped kitchen is accessed through a wooden arch. There are two bedrooms, one with a double bed and the other with two single beds. The bathroom has a shower cubicle, wash hand basin and WC. 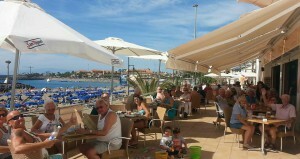 Restaurant on the sea front at Playa de las Vistas. 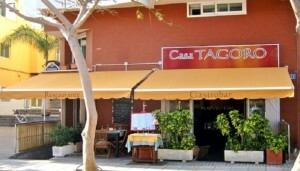 La Barca Restaurante is a Canarian restaurant situated on the sea front at Las Vistas beach. It therefore enjoys great sea views. There are both inside and outside tables and all the fresh fish available is on display in a glass fridge unit at the back of the restaurant. The menu includes King prawns and white fish on a skewer with Canarian potatoes and salad, Giant T-Bone steak, lobster soup, salt baked dorado or sea bass, paella marisco (seafood) with papas arrugadas (Canarian potatoes). There is also a huge selection of desserts. Local wines are available including Vermejo from Lanzarote which is very good. This Orlando apartment to rent in Tenerife has one bedroom and has been refurbished to a high standard in a modern style. This stylish Orlando apartment to rent in Tenerife has been fully refurbished in a modern style. It is situated on the 2nd floor overlooking one of the the swimming pools of the complex. The balcony is equipped for alfresco dining and even has a little mini kitchen with sink. Inside the lounge has a comfortable sofa bed and a flat screen TV with satellite channels. There is also a dining table and 4 chairs. The kitchen is extremely well equipped for a small apartment, and even has a dishwasher and washing machine as well as a large fridge/freezer and oven. This is in addition to all the usual items such as microwave, hob, coffee maker, toaster, kettle etc. The bathroom has a large walk-in shower, wash hand basin and WC. Situated in the square in the centre of the Sunset Bay resort. 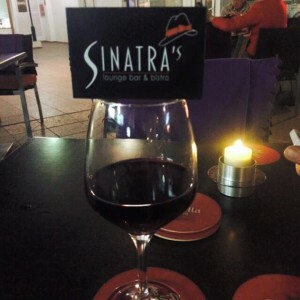 Sinatra’s Lounge Bar and Bistro is highly rated on TripAdvisor, infact no 25 out of 179 restaurants and bars in Costa Adeje, Tenerife. I has been awarded the Certificate of Excellence on this site. It is situated in the square in the centre of the Sunset Bay hotel and is therefore very close to the Orlando complex. As it is a small bar it is advisable to book in advance as it can get very busy. The chef Kevin always comes out to talk to guests after he has finished cooking to check if they were happy with their food. The menu varies daily and is always cooked fresh. If the Chef runs out of something, that’s it, no resorting to the freezer for substitutes. The Tapas night on Mondays is worth trying. The menu includes a lot of steaks which can be cooked according to guests preference. They come with real vegetables, not just with chips. The Chef even makes homemade fish fingers for the children. The menu also includes hot chicken caesar salad, steak and kidney pie, chicken stuffed with haggis and whisky. And to wash it down the homemade sangria, is highly recommended, but quite strong!